Whether you scramble them, fry them, boil them, poach them or use them as a main ingredient in a delicious dish, the possibilities are almost endless when it comes to preparing eggs. “Eggs are so good for you,” Liano said, explaining they are the most complete protein you can eat, making them a superfood for everyone from picky kids to vege­tarians. One large egg lives up to its incredible edible status by provid­ing 6 grams of protein, about 13 percent of the daily recommended intake, as well as vitamin A, vita­min D, vitamin E, vitamin B12, vitamin B6, folate, thiamin, riboflavin, phosphorus, zinc, iron and choline. Choline is essential in brain development and aids in learning and memory. One of the egg’s biggest advan­tages is its versatility. In her cook­book, Liano refers to the egg as a culinary miracle of nature and shows readers how to make scrambled, fried, boiled and poached eggs as well as omelets, scrambles and baked egg dishes. Eggs are accessible to anyone, Liano said, and these days you can find fresh, pasteurized eggs at many farmers markets. She’ll often hard-boil a dozen eggs at the beginning of the week so she has them on hand to use for school lunches, quick snacks, breakfasts or as an ingredient in salads or sandwiches. “So many ethnic cuisines use eggs as well, allowing cooks to dabble into Indian, Thai and Mex­ican dishes to shake up their egg repertoire,” Liano said. Barton Brooks, founder of the international volunteer organization Global Colors, said eggs and chickens are an invaluable resource to impoverished countries such as Uganda. To Barton Brooks, eggs are more than an ingredient in an omelet, they’re also a way to save lives. “I can think of nothing better than having a chicken,” said the founder of the Global Colors proj­ect, an international volunteer organization. Chickens provide a constant food source through egg produc­tion and an unlimited means of wealth to otherwise impoverished people in Third World countries such as Uganda. His idea of setting needy fami­lies up with a chicken started when he was looking at the chick­en programs in Cambodia. “You give a family a chicken and in two years, they have an entire farm,” Brooks said. Brooks tells the story of intense poverty suffered by the Batwa people in Uganda. “These people were eating grass and maybe a potato a day,” Brooks said. 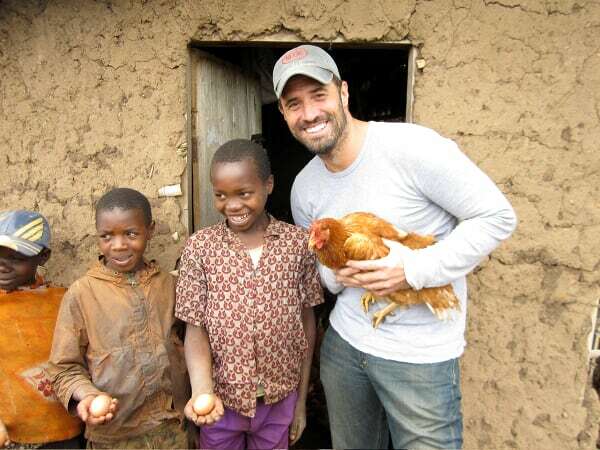 Being a gym rat, Brooks knew the nutritional benefits of an egg white as a staple, so it made sense to him to bring chickens to the Batwa. “You give a kid a chicken, you give him something to do, some­thing to take care of, something to love,” he said. Liano agreed to share two of her favorite recipes. Imagine a savory baked French toast — tender slices of bread soaked in a rich custard, spicy Italian sausages and smoky Gouda cheese. This hearty strata is substantial enough for dinner but also perfect for a cozy week­end brunch. Serve with a simple mixed green salad. Butter a 13-by-9-inch glass bak­ing dish. In a bowl, whisk togeth­er the eggs, milk, cream, Parme­san cheese, parsley and a pinch each of salt and pepper. Heat the oil in a frying pan over medium heat. Add the sausage, using a wooden spoon to break it into bite-size pieces. Cook, stir­ring occasionally, until the sausage begins to lose its pink color, two to three minutes. Add the mushrooms with a pinch each of salt and pepper and cover the pan, cooking until the mushrooms begin to wilt, about two minutes. Remove the cover and continue cooking, stirring occasionally, until the sausage is cooked through and the mushrooms are tender, three to four minutes. Using a slotted spoon, transfer the sausage and mushrooms to paper towels. Arrange half of the bread on the bottom of the baking dish. Top with half of the egg mixture, half of the Gouda cheese, and half of the sausage and mushroom mixture. Repeat the layering, using all the remaining ingredi­ents. Using a spatula, press on the top layer of bread to be sure it is covered in the custard. Let the strata stand for 30 minutes at room temperature, occasionally pressing on it with the spatula to keep the bread well coated. Preheat the oven to 350°. Bake the strata until golden brown, puffed, and set, about one hour. Halfway through the cooking time, remove the strata from the oven and press on the top layer of bread, keeping it submerged in the custard. Let the strata rest for 10 minutes, then serve. 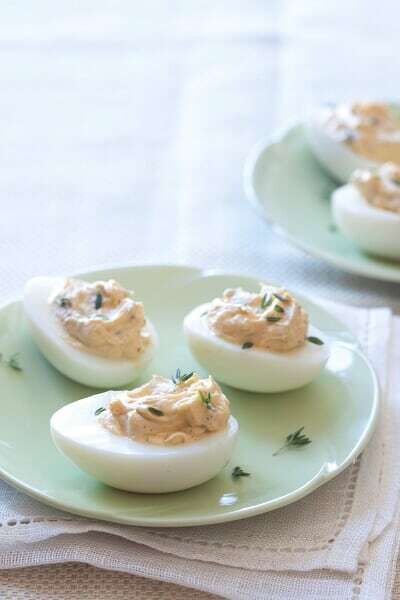 The perfect two-bite snack, deviled eggs are a popular party food. This updated version includes fresh thyme, minced shallots and tart cornichons, which add a little crunch. The sprinkle of cayenne pepper adds just enough “devil” to the filling. Place the eggs in a saucepan with enough cold water to cover them by 1 inch. Bring to a boil over medium-high heat. Remove the pan from the heat, cover and let stand for 14 minutes. Drain the eggs, then transfer them to a bowl of ice water to cool for at least five minutes. Peel the eggs and cut them in half lengthwise. Scoop the yolks into a bowl. Place the whites, cut side up, on a serving plate. Use a fork to mash the yolks until smooth. Add the mayon­naise, mustard, shallots, corni­chons, cayenne, 1 teaspoon of the thyme, and a pinch each of salt and pepper. Whip the mixture together until light and fluffy. Using a small spoon, scoop the yolk mixture into the egg white halves. Alternatively, transfer the yolk mixture to a small plastic bag, cut a ½-inch hole in one cor­ner, and pipe the mixture into the whites. Top the eggs with a sprin­kle of the remaining thyme.